Located in the heart of the South Central Kansas prairie, KLOUDBusters epitomizes the best of High Power Rocketry in the United States. With a large active membership and dedicated Board of Directors, KLOUDBusters has maintained the same launch site since 1991. Flying monthly near the town of Argonia, Kansas, with a one-hour drive time southwest of Wichita, KLOUDBusters hosts 3 major launches each year and monthly fun flies. Additionally, at the same site KLOUDBusters has hosted the annual Tripoli Rocketry Association national launch LDRS six times: 1993, 1994, 1999, 2003, 2008 and most recently in 2011. KLOUDBusters has now also won the bid to host LDRS 38, making this our unprecedented 7th time as LDRS hosts. KLOUDBusters has also hosted the inaugural Discovery Channel "Rocket Challenge" in July 2003 and the History Channel "Large Dangerous Rocket Ships" program in 2011. N E W !!! N E W !!! N E W !!! What separates KLOUDBusters from other clubs across the nation is that exceptional flying field - known to the locals as The Rocket Pasture. Launch operations are based from that 40 acre all-weather field, recovery is provided in adjacent farmland stretching for miles and literally as far as the eye can see and owned by the friendly farmers whose goodwill we depend upon and foster. The available waiver for all KLOUDBusters launches is 50,000' AGL. All flights over 23,000' require prior approval from the KLOUDBusters Prefect - application here. Contact the KloudBusters prefect for further details. 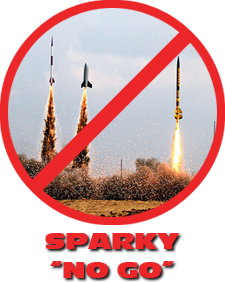 Please refer to the KLOUDBusters Rules for Multi-Staged Rockets and Operation of Unmanned Aircraft Systems (R/C aircraft/drones) if you plan on either of these activities at the KLOUDBusters launch site. With the help of our diverse and talented membership, KLOUDBusters has built an enviable infrastructure that remains on most clubs' wish lists. Beginning with the finest advanced launch control electronics and extending to our heavy-duty high-power launch pads; the launch setup has the capability to handle 64 launch pads simultaneously. Launch operations also includes a new state-of-the- art public address system, 20x40 circus style tent for spectator comfort and other amenities to provide a premiere launch experience. High Power Rocketry enthusiasts and their families from all across the central USA converge on Argonia, Kansas to enjoy best-of-the-best at KLOUDBusters launches. Navigate here for complete details, driving directions, and the launch schedule. Click on the various navigation buttons (left side of the screen) to surf out to the information on this site. Bob Brown is our TRA Prefect.